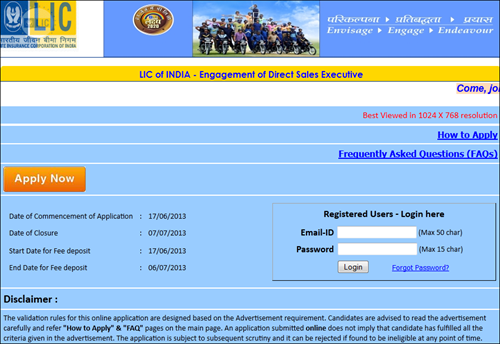 Read about LIC recruitment June 2013 for 13,148 direct sales executive with 505 vacancies in Kerala. Candidates can apply online at the official website of LIC at www.licindia.in and with adequate details. The last date for applying online is 7th July 2013. Life Insurance Corporation of India has invited applications for the post of 13,148 direct sales executives ((DSE). As the vacancies are spread across various parts of the country, 505 posts will be free in Kerala circle. Candidates who are interested while having the eligible education can apply online at the official website of LIC at www.licindia.in and with adequate details. The last date for applying online is 7th July 2013. Age: The age of the applicant should be minimum 18 years and not more than 35 years as on 01/06/2013. As per the government rule, age relaxation is also given. Application Fee: Candidate should have to pay Rs 100/- which should be paid as cash at any LIC branch. The Account code is 114034. Pay Scale: Candidates who are selected would be given apprenticeship and the fixed stipend during the time is Rs. 3500/- will be paid. Good salary will be paid later. Education: Candidate who wishes to apply for the post should have Bachelor Degree from any recognized University in India. Those having Bachelor Degree or Diploma Degree in Marketing will be given preference. Good knowledge of English, local language and computer soft skills would give extra advantage for the candidate. Selection procedure: The selection is made as per written exam which would be conducted on a convenient date. Candidates will be selected on the basis of performance in the exam. Those eligible candidates will be called for an Interview. The number of candidates called for the interview will be restricted to commensurate the number of vacancies for Direct Sales Executives. How to apply: Candidates should have to go through the notification and find the number of vacancies in the respective region. Later the candidates have to apply online from the official site of the LIC. Are you searching for a perfect job in Kerala? Here you are at the right page and the whole page will give you enough plus sound details for how to apply for the Kerala PSC recruitment 2012, and they have announced it for 96 various vacancies. The candidates can apply via online, and the entire notification will be given in the following article. Kerala Public Service Commission Recruitment for excise preventive officer vacancy details are given here. Kerala government offers some vacancies and announces the vacancy to fulfill the vacant. Among that criteria Kerala Public Service Commission now announces the vacancy to fill the position of excise preventive officer and the complete details about the procedure for recruitment and the remaining criteria are listed below in detail scroll down to know the details.